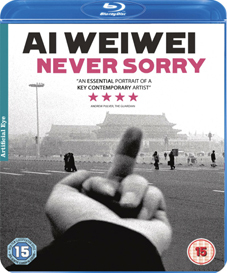 Ai Weiwei: Never Sorry is the first feature-length film about the internationally renowned Chinese artist and activist, Ai Weiwei. In recent years, Ai has garnered international attention as much for his ambitious artwork as his political provocations. Ai Weiwei: Never Sorry examines this complex intersection of artistic practice and social activism as seen through the life and art of China's preeminent contemporary artist. From 2008 to 2010, Beijing-based journalist and filmmaker Alison Klayman gained unprecedented access to Ai Wei wei. Klayman documented Ai's artistic process in preparation for major museum exhibitions, his intimate exchanges with family members and his increasingly public clashes with the Chinese government. Klayman's detailed portrait of the artist provides a nuanced exploration of contemporary China and one of its most compelling public figures. Described in The Observer as "An essential portrait of a key contemporary figure" and winner of the Special Jury Prize for Documentary at this year's Sundance Film Festival, Ai Weiwei: Never Sorry will be released on UK DVD and Blu-ray on 8th October 2012 by Artificial Eye at the RRP of £15.99 for the DVD and £19.99 for the Blu-ray. If you've not seen the film yet, put in on you must-see list and be tempted by the trailer below.